This inflatable is perfect for toddlers. 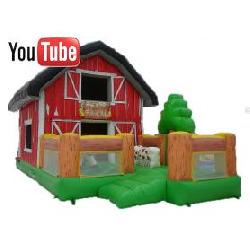 It has a 3 foot climber and slide, crawl through hay stack, barrel, and a jumping area. Dimensions: 28'L x 15'W x 15'H. Please allow 32'L x 19'W space for adequate clearance.